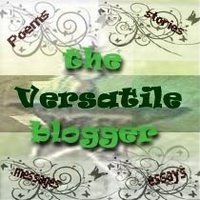 Well, the “Versatile Blogger” award really came as a surprise to me. For that, I thank my dear blogger friend, Wanderer as I humbly accept the award from her :) Surely an award like this boosts you up. I will try to live up to the expectations that an award like this comes with as I keep strolling along the Random Paths. The wind in my hair and the sand at my feet. 2. I’m really fond of dark chocolates. 3. I love walking in the rain. 4. From a very young age I found the books very fascinating and I always enjoy their unselfish company. I think they really help to nourish your mind, make your thoughts wise and tolerate. 5. I’m always in search of knowledge as I stroll along the Random Paths of life, and always delve deep while studying a subject which I find interesting. Nothing superficial is important to me in this regard. 6. I find interests in photography and graphics design (I think it’s already evident from my blog). 7. I believe that in every moment of life there is a scope to improve myself so I always strive to do better.